What are parish marriage preparation classes? St. John’s offers a series of six (6) evening presentations on topics directly related to a Christian Married Life. These classes are taught on one night for six consecutive weeks. Cost: $85 non-refundable fee for these classes, due on or before the first night of classes, paid to the parish office. How do we get started on the classes? At least six months before the desired date of marriage, you must schedule a meeting with a priest or deacon who will conduct a “pre-nuptial investigation.” The law of the Church provides certain procedures to determine that a pending marriage is not being coerced and is free from impediments. A “prenuptial investigation” or the "paperwork" consists of gathering documentation / statements from the bride, the groom, and witnesses that testify to freedom from coercion and impediments to the marriage. The interviewing priest or deacon can and will explain the meaning of these documents. Please bring your baptismal certificate. Catholics are bound to follow the discipline of the Church; therefore, a Catholic with only a civil marriage is not a recognized Sacramental union. If you are Catholic and have previously entered a civil marriage with a person other than your current bride or groom, and went through a civil divorce, that “civil marriage” must be declared null and void by the Church. Any prior marriages by either party must be investigated, and it is possible an annulment process will have to take place. If either bride or groom has secured an annulment through the Church tribunal, simply submit the paperwork associated with that process including the declaration of a freedom to marry. If you are civilly married to your current bride or groom, we would be happy to celebrate a ceremony for you that the Church calls convalidation. What if we cannot do these things? Please tell us about your circumstance, it could be that unique circumstances can be accommodated. One of the first decisions that a couple should make is choosing the presider. At the Cathedral, for those who are parishioners, our priests and deacons will be happy to assist you in preparing for the wedding. You can always request one of the clergy you feel most comfortable with, or we can assign one of our clergy to assist you. A wedding can be celebrated as a Nuptial Ceremony within Mass or a Nuptial Ceremony outside of Mass. A couple who belong to another parish must seek permission from their own pastor to be married at the Cathedral. Notify us once that permission has been granted. The priest/deacon should first ask for delegation approval directly from Father Jerry Funke. He can reach Fr. Jerry at [email protected], or at 342-3511 x101. Fr. Jerry will let the parish staff know if he has granted delegation. The priest/deacon will be responsible for helping you to complete paperwork required by the diocese. An honorarium or donation to the clergy may be given directly to them. The priest/deacon must advise us when the file is complete before the wedding, and provide a copy at least two weeks prior to the wedding so that all church certificates can be prepared, delegation signed, and sacramental records created. All wedding policies of the Cathedral must be followed, including those governing decorating, availability, cleaning, etc. If a couple will be inviting a non-local priest from the Diocese of Boise to preside at the wedding, our deacons may be available to help with completing the preparation process if the couple lives in the local area. 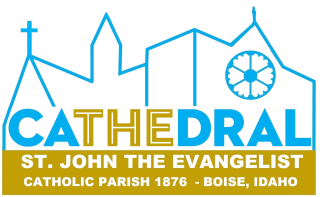 If the couple lives outside of the Boise area, they can obtain preparation, and complete necessary paperwork, at their local parish, provided we are aware of what they are doing, and the presider approves. If the couple will be inviting a priest from outside the Diocese of Boise to preside or concelebrate at the wedding, we must be provided with the name of the priest, his address, his assignment, and the name and address of his superior (Bishop or Religious Superior) as soon as possible after the invitation is made. Our Cathedral staff will take care of seeking permission and a letter of good standing through our Bishop's office, as required by our Diocese. It is possible that, if you are working with one of our Cathedral priests or deacons, their assignment to the parish could change while you are preparing. If a member of the clergy you are working with is no longer available, please be assured that one of our other clergy will step in and complete the process with you.